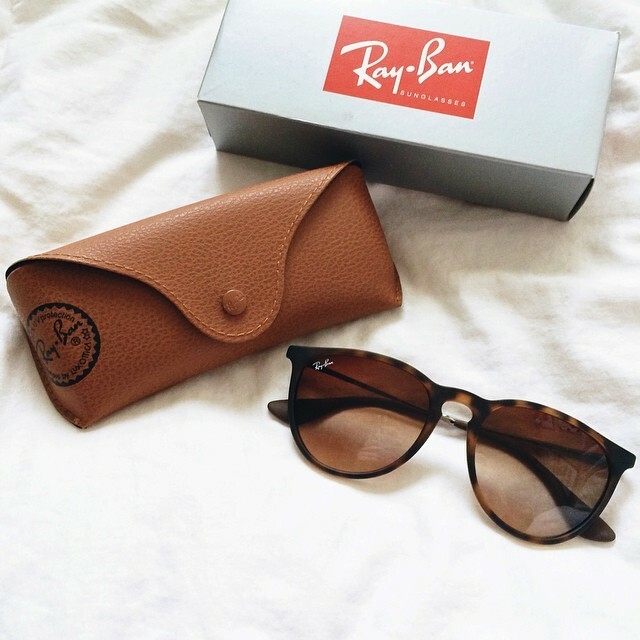 I recently got my first pair of Ray Bans! And thanks for Bluefly, for a pretty good deal! These are the Erika style in tortoise. They were marked down already, and they offer $25 off for your first purchase :) via my Instagram I never really been one to invest in sunglasses, and I never realized how important sunglasses would be just walking to class in the winter, until last year. I actually used to put my sunglasses away at college once fall came around, because I wasn't spending a lot of time outside, and I didn't have a car up at school so I didn't need them for driving. But we have started to have a lot more sun we did than my freshman year during the snowy season then. I sometimes feel basically blind from staring at the snow with the sun reflecting off of it! I usually just buy really cheap sunglasses and they always end up breaking within a few months or so. With the exception of my favorite Anthropologie pair, which are unfortunately no longer available :( I've always really liked expensive sunglasses, I just didn't think I would wear them enough. But now that I have my car on campus, and the sun reflecting off of snow has been bothering me, I think they are well worth it! I'm super excited about my new Ray Bans. However since I got them, it has been either snowing all day long, just really cloudy with the threat of snow, or sunny and very very cold. Anyway, I really love them and I know I'll be getting a lot of use out of them in the coming spring if I don't in the winter! Here are links to my new Erikas, and some other sunglasses I really love!